Kurt Hauptmann will learn to make stained glass to help men see the glory of God, one of the many bizarre heritages handed down from his ancestry. But the family has other, more frightening secrets. The path to God runs through darkness as well as light. And the bond of a family is blood, its own and that of its enemies. What is the strangeness in Uncle Detlef, head of the stained-glass studio? Why has he descended from his cathedral roofs to steeplejack the perils of a secular world? What are his secrets? Why do the family's holy rites seem perverse? Most of all, why are men getting killed in bizarre, archaic ways here in South Florida? As Kurt gropes toward the truth, so does the tough and cynical cop, Jack Skelote. What lies before them is a limbo of murdered martyrs, unblessed, unholy, and unburied. Yes. 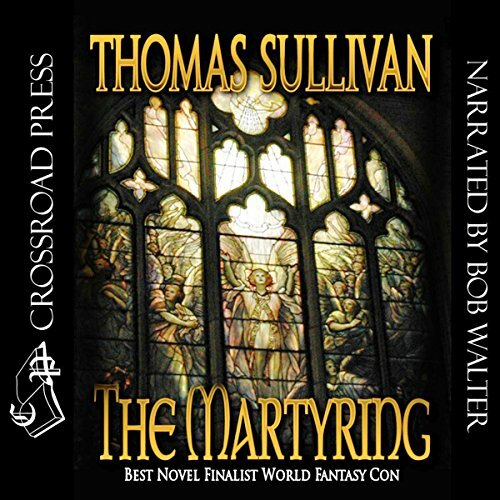 Bob Walter has the kind of voice that I put on a short list of those who - as narrator - could influence me to listen to a book I might otherwise have ignored. The story is rich and complex and the characters are vivid. What was one of the most memorable moments of The Martyring? Without giving anything away, I would have to cite the scenes where the protagonist and his cousin interact closely. Which character – as performed by Bob Walter – was your favorite? If you could rename The Martyring, what would you call it? An interesting work poorly narrated. This work appeals on several levels, mixing historical details and the suspense the of a modern thriller. Would you be willing to try another one of Bob Walter’s performances? Bob Walters narrates this work with a repetitive, monotonous rhythm and intonation. He forces the text into this odd and annoying cadence instead of letting the work determine the beat and tone. The effect is distracting and makes it difficult to absorb or become absorbed in the story. This work deserves better. I will avoid this narrator in the future.